This entry was posted in environmental studies, Sci&TechStudies(STS) and tagged Butler, future, Raymond Williams on January 8, 2016 by Peter J. Taylor. (Continuing from previous posts.) Such questions became more pointed when I heard that, in late 2002, a major employer in the West Nipissing region, Weyerhaeuser, closed its container-board plant. A local newspaper article quoted a Weyerhaeuser spokesperson: “[T]he decision to close the facility is not a reflection on the employees of Sturgeon Falls and their abilities and efforts… It was made for economic reasons beyond their control.” The spokesperson went on to explain that “the company’s preference would have been to keep all facilities running, but the market changes and current economic conditions forced their hand.” “If we as a company do not adapt, then we will not survive and none of our employees will have jobs.” The community sprang into action and threatened lawsuits, but the plant closure was not reversed. There is more to learn about the community’s response (and for this I am planning a research visit). In the meantime, discussion with colleagues involved in regional economic development has led me to adjust the local—trans-local contrast. The translocal side is not only about perspectives or knowledge, but can also encompass resources that could be brought to a locality or withdrawn and withheld from it. There is room to think about and to explain which aspect of the translocal comes into play—knowledge or resources; contributed or withheld—and how they interact with solidarities forged through working and living together in particular places. Moreover, there is always room to pay attention to the unevenness of militant particularist loyalties or solidarities. (Aside: although I have emphasized the single tension in Williams’s novels, the theme of internal differentiation within any class or place is just as important.) When the local scales up to the level of a nation, for example, translocal often corresponds to international financial or military knowledge and resources. Naomi Klein’s (2007) case studies in what she calls disaster capitalism show that, in the space that crises open up, plans gain traction for restructuring economic arrangements through privatization and other favorable conditions for foreign investors, through drastic cuts in government spending, and through elimination of regulation of labor conditions. The traction always depends on some groups within the nation accommodating and others being disadvantaged or disempowered. Klein shows how this operated: from the military suppression of dissent that accompanied the import of Milton Friedman’s economics into Chile after the 1973 overthrow of the Allende government, through the secret meetings of experts and subsequent State of Siege that paved the way for the economic shock therapy in Bolivia in the mid-1980s, to the economic agreements made by the A.N.C. in South Africa as their leaders focused on avoiding a civil war and negotiating the political path to a post-apartheid democracy. And, over the last year, we might add, to the massive government bailouts of investment banking corporations. 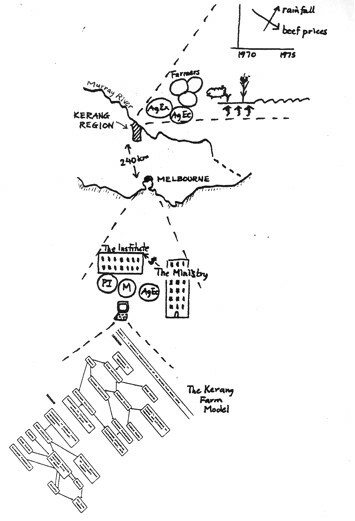 Although Klein’s macro-political-economic analyses might seem to take us far away from social-environmental engagements in West Nipissing or Wales—or Lowell—, I have ended with them to emphasize that anyone wishing to take seriously the participation of diverse people whose livelihoods are directly dependent on any ecosystem or city has to recognize the ever-present potential for their accounts and engagements to be confounded by what is left outside. The challenge for the environmental researcher is to work with the tension between the local and the translocal, to contribute—but not to impose—analyses of changes that arise beyond the local region and at larger scales. Klein, N. (2007). 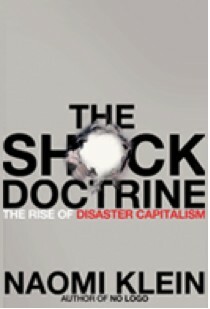 The Shock Doctrine: The Rise of Disaster Capitalism. New York, Metropolitan Books. This entry was posted in environmental studies, Sci&TechStudies(STS) and tagged city, environmental studies, militant particularism, naomi klein, Raymond Williams, shock doctrine, west nipissing, wyerehaeuser on August 17, 2011 by Peter J. Taylor. (Continuing from previous posts.) My thinking about this local/translocal tension has been stimulated by a wonderful essay by the geographer David Harvey about the work of the Welsh/English cultural analyst Raymond Williams: “Militant Particularism and Global Ambition.” Harvey’s essay analyzes the fictional works of Williams at the same time as he weaves in reflections on his own experience as a professor at Oxford University. Harvey had arrived in Oxford in 1989 fresh from completing The Conditions of Post-Modernity (Harvey 1989)—a book that was to become widely read and influential. He was soon drawn in as a “big name” to co-edit a volume of contributions from union activists and academics (Hayter and Harvey 1993). The focus of the project was the decline of the Cowley car plants that had fueled the economy of Oxford since the 1920s—as well as being the locus of many significant industrial disputes. During the 1980s the car plants had been subject to repeated cutbacks. Their closure and redevelopment of the land for a business park was a constant threat. Teresa Hayter, the volume’s other editor, had tirelessly campaigned with other shop-floor militants to preserve the plants and the remaining jobs—without the support of the union leadership and local Labour council. When Harvey composed a concluding chapter that entertained other strategies concerning the plant closing and the economic future of Cowley, Hayter challenged him to define his “loyalties” (Harvey 1995, 71). In the “Militant Particularism” essay, Harvey describes his position as wanting to chart a long-term trajectory when, in the short-term, there were few alternatives for local workers if the remaining jobs were lost. The situation did not lend itself to a simple reckoning of his loyalties: the work conditions at the plant were deteriorating; the plant’s paint shop was a serious source of pollution; working-class solidarities around the plant were weakened and broader coalitions were needed; excess production capacity for cars prevailed in Europe, indeed Cowley produced Rovers—luxury cars for the wealthy; and the corporate owners of the plant were making decisions based on fluctuations in stock-market and property values. Intellectually, Harvey wanted these issues to be raised so readers of the volume could “consider active choices across a broad range of possibilities,” yet he recognized that “the impetus for the campaign, the research, and the book did not come from [himself, but] arose out of… a tradition of union militancy emanating from the plant.” He wanted political discussion to be guided by abstractions at spatial and temporal scales larger than the local and immediate, yet felt uneasy—disloyal—to impose that “upon people who have given their lives and labor over many years in a particular way in a particular place” (Harvey 1995, 73). Norman had been in Wales in the 1930s doing political education with militants. His relationship with Gwyn’s mother was cut off, however, when he followed the Communist Party’s orders to work undercover in France and Spain during the Spanish Civil War and later, in England, around anti-German code-breaking and then Cold War developments in computing. Gwyn was raised in Wales by his mother and stepfather, Bert, a miner all his life, except for war service against Franco and Hitler. The novel adds a temporal, trans-generational dimension to the local/translocal tension when the middle-aged Gwyn and elderly, long-retired Norman meet for only the second time. Norman pushes Gwyn to acknowledge that his scientific career has taken him away from his birthplace and enabled him to see more about ways the world is changing than people who remained in the Welsh towns. Political involvement, Norman argues, cannot be a simple matter of Gwyn staying loyal to his roots. 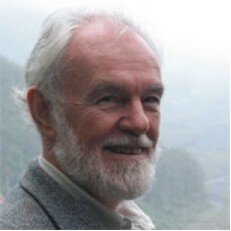 Given the “powerful forces” that shape social and environmental change, we can “in intelligence” grapple with them “by such means as we can find” and take a deliberate path of action, but “none of us, at any time, can know enough, can understand enough, to avoid getting much of it wrong” (Williams 1985, 357-8). Or, in the words of another character in the novel, Norman’s close intellectual and political colleague, Monkey Pitter, if we “go on saying the things we learned to say and it will be just strange talk, in a strange land” (161). Rather than view these conclusions nihilistically, Williams, in Towards 2000, written in the early 1980s, expressed his hope for “detailed, partipat[ory], consciously chosen planning” and opposition to the crisis-management and “politics of temporary tactical advantage” he saw ascendant in the 1970s and 80s (Williams 1983, 11-12). He would, I suspect, have been impressed by what has been achieved in West Nipissing, yet may have expressed uncertainty about its wider implications. To what extent could such local planning mitigate adverse decisions made in governments and corporations operating on a larger spatial and temporal arena? In what ways would it be important to incorporate the knowledge-making of non-local or trans-local researchers—people who did not share experience of and commitment to livelihood in one place? Harvey, D. (1989). The Condition of Post Modernity: An Enquiry into the Origins of Cultural Change. Oxford: Blackwell. —— (1995). 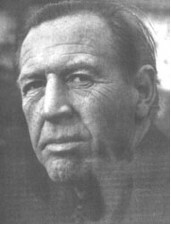 “Militant particularism and global ambition: The conceptual politics of place, space, and environment in the work of Raymond Williams.” Social Text 42:69-98. Hayter, T. and D. Harvey (Eds.) (1993). The Factory and the City: The Story of the Cowley Automobile Workers in Oxford. Brighton: Mansell. Williams, R. (1983). The Year 2000. New York: Pantheon. —— (1985). Loyalties. London: Chatto & Windus. This entry was posted in environmental studies, Sci&TechStudies(STS) and tagged city, david harvey, environmental studies, Hayter, loyalties, militant particularism, Raymond Williams, Year 2000 on August 16, 2011 by Peter J. Taylor. (Continuing from previous post.) In the late 1990s I pursued my interest in participatory research and engagement by undertaking some facilitation training at the Canadian Institute of Cultural Affairs (ICA). ICA’s techniques have been developed through several decades of “facilitating a culture of participation” in community and institutional development. Their work anticipated and now exemplifies the post-Cold War emphasis on a vigorous civil society, that is, of institutions between the individual and, on one hand, the state and, on the other hand, the large corporation (Burbidge 1997). ICA planning workshops involve a neutral facilitator leading participants through four phases—practical vision, underlying obstacles, strategic directions, and action plans (Stanfield 2002). These mirror and make use of the “objective, reflective, interpretive, decisional” steps of shorter ICA “focused conversations” (Stanfield 1997). The goal of ICA workshops is to elicit participation in a way that i) brings insights to the surface and ii) ensures the full range of participants are invested in collaborating to bring the resulting plans or actions to fruition (Taylor 1999c). 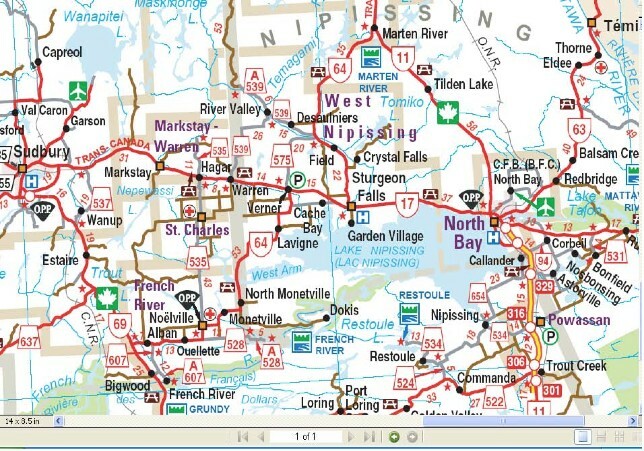 Such investment was evident, for example, after a community-wide planning process in the West Nipissing region of Ontario, 300 kilometers north of Toronto. In 1992, when the regional Economic Development Corporation (EDC) enlisted ICA to facilitate the process, industry closings had increased the traditionally high unemployment to crisis levels. As well as desiring specific plans, the EDC sought significant involvement of community residents. Twenty meetings with over 400 participants moved through the first three phases—vision, obstacles, and directions. The results were synthesized by a steering committee into common statements of the vision, challenges, and strategic directions. A day-long workshop attended by 150 community residents was then held to identify specific projects and action plans, and to engage various groups in carrying out projects relevant to them. A follow-up evaluation five years later found that they could not simply check off plans that had been realized. The initial projects had spawned many others; indeed, the EDC had been able to shift from the role of initiating projects to that of supporting them. Over 150 specific developments were cited, which demonstrated a stronger and more diversified economic base, and a diminished dependence on provincial and national government social welfare programs. Equally importantly, the community now saw itself as responsible for these initiatives and developments, eclipsing the initial catalytic role of the EDC-ICA planning process. 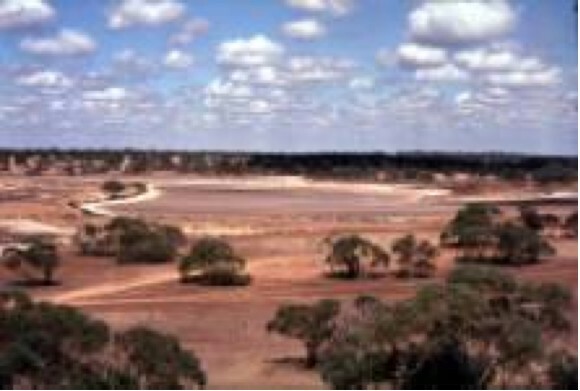 When I learned about the West Nipissing case, I could not help contrasting it with one of my earliest research experiences, modeling the social-economic-ecological future of an agricultural region in Australia beset by soil salinization and econmic decline. In that research, a detailed scientific analysis was conducted at some distance from those directly affected by the problems of salinization and economic decline. Projections of the economic and ecological future were straightforward as long as they preserved the basic structure of the situation. When innovative possibilities, such as reforesting abandoned land, were considered, the analysis became difficult. The audience for the final analyses was small and attention to the report short-lived. The state government water resources ministry that commissioned the research was unable to implement the policy change that it turned out they wanted the study to support, namely increasing the price charged for irrigation water. Nothing more then became of the two or three person-years of research in the wider agronomic, economic, environmental, and social dynamics (see Taylor 2005, 94ff). 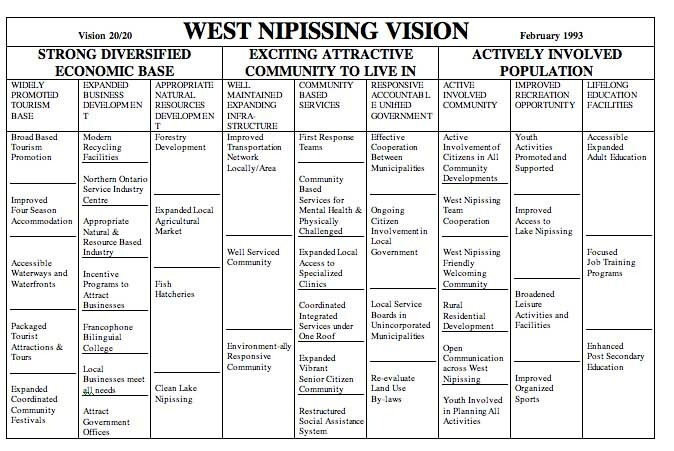 In contrast, the West Nipissing plan built from straightforward knowledge that the varied community members had been able to express through the facilitated participatory process. The process had been repeated, which presumably allowed them to factor in changes and contingencies, such as the start of the North American Free Trade Association and the decline in the exchange rate with the USA. And, most importantly, the process has led community members to become invested in carrying out their plans and to participate beyond the ICA-facilitated planning process in shaping their own future. Some difficult questions for me were opened up by this contrast. 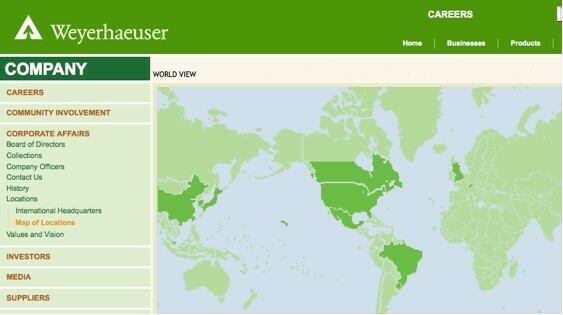 My own environmental research had drawn primarily on my skills in quantitative methods. What role remained for researchers to insert the translocal into participatory planning, that is, their analysis of changes that arise beyond the local region or at a larger scale than the local? For example, even if I had moved to the Kerang region and participated directly in shaping its future, I would still have known about the government ministry’s policy-making efforts, the data and models used in the economic analysis, and so on. Indeed, the “local” for professional knowledge-makers cannot be as place-based or fixed as it would be for most community members. What would it mean, then, to take seriously the creativity and capacity-building that seems to follow from well-facilitated participation but not to conclude that researchers should “go local” and focus all their efforts on one place? Burbidge, J., Ed. (1997). Beyond Prince and Merchant: Citizen Participation and the Rise of Civil Society. New York, Pact Publications. Stanfield, R. B., Ed. (1997). The Art of Focused Conversation. Toronto, Canadian Institute of Cultural Affairs. Stanfield, R. B. (2002). The Workshop Book: From Individual Creativity to Group Action. Toronto, Canadian Institute of Cultural Affairs. Taylor, P. J. (1999). “Basic propositions of the workshop process.” http://www.faculty.umb.edu/pjt/ICApropositions.html(viewed 12 December 1999). This entry was posted in environmental studies, Sci&TechStudies(STS) and tagged boundaries, city, environmental studies, militant particularism, Raymond Williams, Year 2000 on August 15, 2011 by Peter J. Taylor.